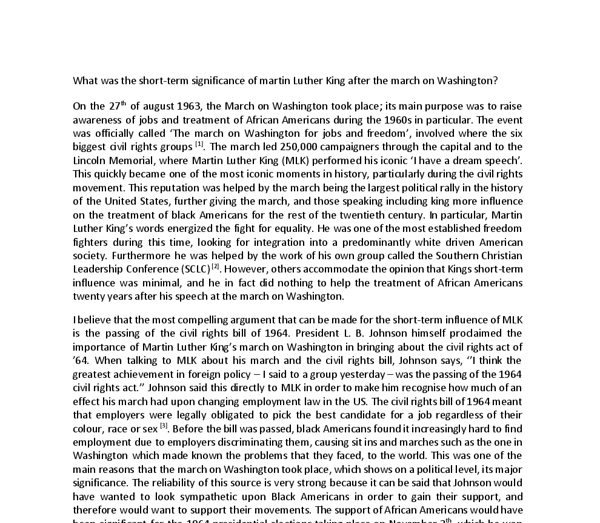 What was the short term significance of Martin Luther King after the March on Washington? 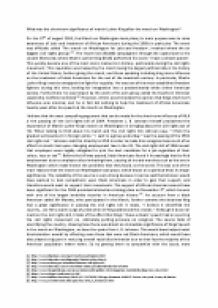 ﻿What was the short-term significance of martin Luther King after the march on Washington? On the 27th of august 1963, the March on Washington took place; its main purpose was to raise awareness of jobs and treatment of African Americans during the 1960s in particular. The event was officially called ?The march on Washington for jobs and freedom?, involved where the six biggest civil rights groups . The march led 250,000 campaigners through the capital and to the Lincoln Memorial, where Martin Luther King (MLK) performed his iconic ?I have a dream speech?. This quickly became one of the most iconic moments in history, particularly during the civil rights movement. This reputation was helped by the march being the largest political rally in the history of the United States, further giving the march, and those speaking including king more influence on the treatment of black Americans for the rest of the twentieth century. In particular, Martin Luther King?s words energized the fight for equality. He was one of the most established freedom fighters during this time, looking for integration into a predominantly white driven American society. Furthermore he was helped by the work of his own group called the Southern Christian Leadership Conference (SCLC) . However, others accommodate the opinion that Kings short-term influence was minimal, and he in fact did nothing to help the treatment of African Americans twenty years after his speech at the march on Washington. I believe that the most compelling argument that can be made for the short-term influence of MLK is the passing of the civil rights bill of 1964. ...read more. They achieved the result that they ultimately where aiming for just as they did in Washington which demonstrates the effect that King had on changing rules around the north of America as well as the south. This source is reliable as it is stating facts of the event. It talks of how a once segregated organization had now become desegregated as a result, and therefore holds a great way in helping to make the judgement on whether or not king had short-term significance, in this case it shows how he did to a great extent. In contrast to this view, it can be said that King didn?t have a great significance after the march on Washington because, despite the influences that he had on changing laws, there were still great economic difficulties for Black Americans. Even King himself acknowledged that he had not changed anything about economic problems. Evidence can be found after the march in Watts, a friend of his called Bayard Rustin writes about what King said to him, ? ?you know Bayard, I worked hard to get these people the right to eat hamburgers, now I?ve got to do something? to help them get the money to buy it.?? This highlights the main problem that King himself could not overcome. His march on Washington won them equal rights in work and employment however it couldn?t do anything about the unequal pay that Black Americans received. This became a big problem to him, as without money, what he had done for African Americans did not have as big a significance as it could have and meant that discrimination was still very much an issue. ...read more. This source is from an article written by someone that sympathises with king greatly as he goes onto say, ? ?If this was manhood, I was in no hurry to join them.?? This shows that he still had significance ad influence on views of people from the racist areas, as this person disagreed with those that opposed MLKs visit. In conclusion, I believe that King had a great deal of short-term significance after his march on Washington. The most compelling bit of evidence that points to this view is the impact he had on passing the civil rights bill of 1964. The nationwide impact was made clear after his death, when in a speech Robert Kennedy said, ?? Or we can make an effort, as Martin Luther King did, to understand and to comprehend, and to replace that violence, that stain of bloodshed that has spread across our land, with an effort to understand with compassion and love??. This underlines the significance of King as such a well renowned figure was encouraging the country to follow in his footsteps, which could be said, is the reason why even more was achieved after his death. As well as the civil rights bill, he also changed the attitudes of some people, which in turn gave him, and the movement more support in order to go on and fight for equality. Therefore, it is impossible to say he had nothing but an incredible influential and significant legacy after the march, which paved the way for future movements and laws to be established. . http://www.infoplease.com/spot/marchonwashington.html . http://www.britannica.com/biography/Martin-Luther-King-Jr . http://www.archives.gov/education/lessons/civil-rights-act/ . http://www.britannica.com/event/United-States-presidential-election-of-1964 . http://www.chicagotribune.com/news/nationworld/politics/chi-chicagodays-martinlutherking-story-story.html . https://www.doi.gov/pmb/eeo/AA-HM . http://www.dailykos.com/story/2014/1/17/1270338/-Chicago-Summers-1966-67-Grown-Wary-and-Weary-of-Racism . http://www.powerfulwords.info/speeches/John_F_Kennedy/8.htm ...read more. Abraham Lincoln was the 16th President of the United States. As a supporter of equal rights, he introduced measures that resulted in the eradication of slavery, signing the Emancipation Proclamation in 1963. Lincoln is remembered as a great leader of the United States, and was victorious in the American Civil War. How many kinds did you kill today? The issues of Civil Rights and Vietnam came together when blacks realised they were more likely to be conscripted than whites 1968 was the peak of protest, and "make Love Not War" the main rallying cry of the Hippy generation. As well as instigating change through directly tackling segregation, Marshall was also significant as a public figure and a role model to others, aided by his confidence. Source 4 provides primary evidence of Marshall's confident personality. The photo shows Marshall in the Whitehouse laughing with President Johnson, following his appointment to the US Supreme Court. He however, believed that unity would be the key to success "it is not that there is no desire for unity, or that it is impossible... it's because most of the organizations are dependent on white money and they are afraid to lose it"34. This is shown through the obstruction of civil rights legislation from 1945 through to 1960. However, we notice that Congress?s attitude towards civil rights legislation had changed. In 1964, 73 out of 100 senators and 289 of the 435 members of the House of Representatives voted in favour for the Civil Rights Act. What was the short term impact of the Montgomery Bus Boycott 1955-1957? It was then that he took the name of Malcolm X. As the years continued this is where we see both men really grow into their calling as black activists. King was full of love, respect and peace and went about fighting for the cause in this way.